(a) Check if there is abnormal metallic sound from the A/C compressor (compressor with pulley) when the A/C switch is on and the A/C compressor (compressor with pulley) operates. If abnormal metallic sound is heard, replace the A/C compressor (compressor with pulley). (a) Using a gas leak detector, check for leakage of refrigerant. If there is any leakage, replace the A/C compressor (compressor with pulley). (a) Check operation of A/C compressor (compressor with pulley). (2) Inspect the A/C compressor (compressor with pulley). The compressor shaft rotates along with the pulley. 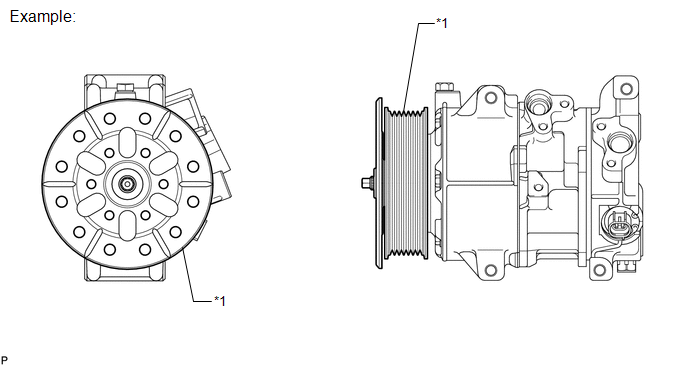 If the result is not as specified, replace the A/C compressor (compressor with pulley).